On the Menu: Callicrate Beef flatiron steak with “house fries tossed in duck fat, guajillo ketchup and balsamic syrup”; several burgers including the “bacon jam”; fried pigs ears as taco shells on Taco Tuesdays; pork belly Benedict for breakfast; and much more! 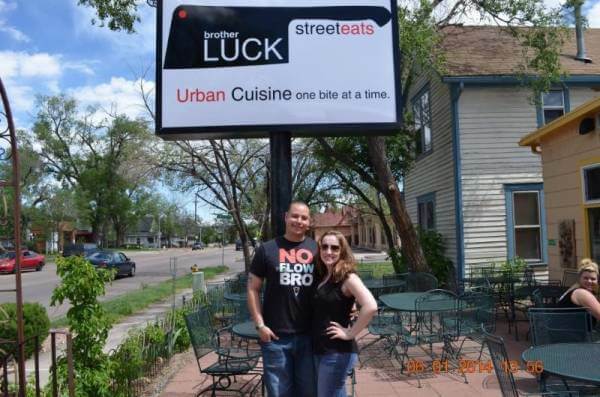 What’s Unique: Since Brother Luck’s Street Eats moved to West Colorado Avenue this summer, this creative local eatery has been thriving, offering patio dining, delicious craft cocktails and a changing seasonal menu of small plates and beautifully presented entrees. It’s also a great place to hang out and eat something as simple and satisfying as a great burger. “I sell way more burgers than I ever dreamed I would,” Chef Brother Luck says (shown above with wife Tina.) Now he’s expanded to offer catering along with special themed dinners for a totally “wow” experience. And he recently introduced an all-day Sunday brunch that runs from 9 a.m. to 4 p.m.